While there are many French brands of goats' milk brie, France is not the only country that makes goats' milk brie. Some Canadian and American cheesemakers also make brie-style cheese from goats' milk. Like brie made from cows milk, goat milk brie has an edible bloomy rind. 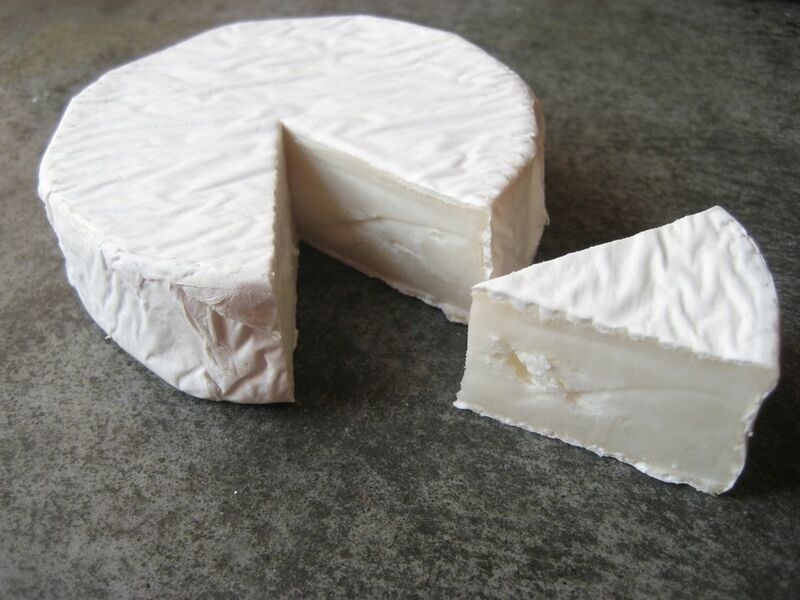 The rind and interior of goats' milk brie are typically white, as opposed to the cream color of cows' milk brie. Goat milk and goat cheese are bright white rather than yellow or cream colored because goats convert the carotene in the grass and hay they eat into colorless Vitamin A. Cows and sheep do not convert carotene into Vitamin A, so the carotene stays in their milk and gives the milk a yellowish color. Different brands of goats' milk brie can vary quite a bit. Typically, however, there is a slight tanginess to goats' milk brie and the texture can be gooey rather than runny. In many cases, goat milk brie is milder and less stinky than a ripe cows' milk brie. For a more flavorful and creamier eating experience, make sure to let the cheese come up to room temperature before eating. Goats' milk brie pairs well with a baguette or crackers and fresh fruit, cured meat, and olives. Many types of white wine pair well, especially a crisp Sauvignon Blanc or Albarino, and sometimes a floral and aromatic white like Torrontes. Goats' milk brie can be used in place of cows' milk brie in any of these recipes that use brie as an ingredient. Is Goat Cheese Easier to Digest? For some people, it is. The fat globules and protein chains in goats' milk are smaller than those found in cows' milk. The fat in goats' milk naturally stays suspended in the milk rather than separating out. This can make goat milk easier to digest.